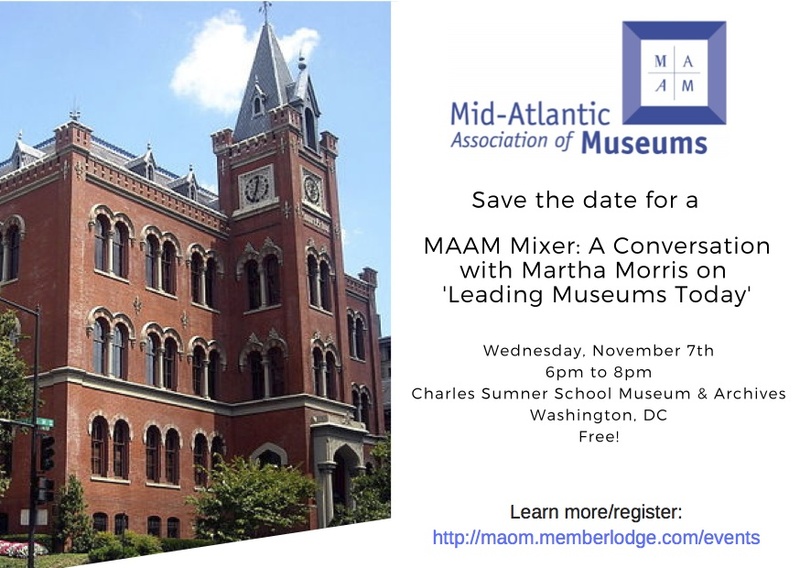 Join us for an evening of networking with colleagues and learn more about all that MAAM has to offer! Distinguished professional Martha Morris (bio below) will present on her newest book Leading Museums Today: Theory and Practice and share valuable insight from her experiences in museums. Light snacks and non-alcoholic beverages provided. Do not miss this opportunity to connect with other professionals in the MAAM region! Martha Morris is associate professor emerita of museum studies at the George Washington University in Washington, D.C. She has over 45 years of experience in the museum field as a manager and leader. Her career began in registration and collections management at the Corcoran Gallery of Art and later at the Smithsonian’s Museum of American History where she eventually served as deputy director. Her work and her teaching have consistently focused on management and leadership practices, including strategic planning, project management, teambuilding, staff development, and facilities projects. As a member of the board of the Midatlantic Association of Museums she served as founding program chair of the annual Building Museums symposium. She has designed workshops, lectured and written on a number of topics including collections planning and management, exhibition development, leading change, museum facilities programs, museum mergers, and 21st century leadership skills. She is author of Leading Museums Today: Theory and Practice, 2018, Managing People and Projects in Museums (2017) and co-author of Planning Successful Museum Building Projects (2009). She holds BA and MA degrees in Art History and a Master’s in Business Administration.